Crack in Trance Advanced Frame? Thread: Crack in Trance Advanced Frame? Hi everyone. My Trance Advanced is my first carbon frame and I admit I am not too knowledgeable about carbon bikes. 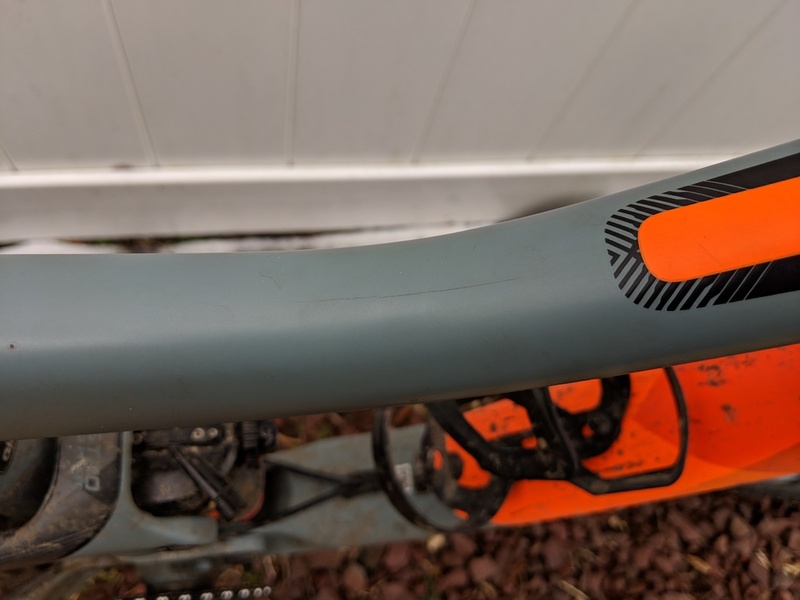 I have a strange line on the bend of the top tube (see image). I can feel it with my fingernail but I am not sure that it is a crack. I haven't had any significant crashes on the bike and I don't think it's impact-related as there are no impact marks or paint scuffs. Do you think this is a crack? My shop checked it out a few months ago and said it is not a crack but I am afraid it's getting worse. Thanks for any help! Looks like a crack to me, but I'm no carbon expert. Why not try another Giant dealer if there's another close enough by? Have you tried simply taping it lightly with the side of a coin to hear if there's a change in tone when you tap around/over it vs further up where the line isn't? One day your life will flash before your eyes, will it be worth watching?? Is your shop the Giant dealer you bought it from? Thanks for the responses. I'm going to try the coin trick. I think that's what my dealer did a few months ago and said he couldn't hear a difference in sound. The shop I brought it to have it checked out is the Giant dealer I bought it from. From what you've said I don't know why the LBS hasn't opened a warranty case with Giant. Even if it's not cracked the paint split would still be a a manufacturing defect IMO. The worst thing that can happen is that Giant deny the claim, best case is repair or replacement at their option. Giant's the biggest bike company in the world and my local reps are stand up guys who 100% back product. I had a similar crack on my 2017 trance advance 2 and Giant replaced the frame. Any updates on this? I just noticed the same thing on my frame except it's smaller. Coin tap sounds the same. I think it might just be the paint but bike is less than a year old and shouldn't have cracked paint already. I'm planning on taking it to my dealer by this weekend. I'll post an update once I can get it there. Thanks for all the responses and help! I brought my bike to the shop I bought it from. The mechanic there is pretty confident it is not a crack but the Giant rep is visiting the shop this week so he is going to take a look at it. The mechanic said the reps are great and will replace the frame if there is any concern at all. I'll post an update when I hear from them. Good to hear. IMO it's a paint defect and I'd push for a replacement. Not yet. If I don't hear by Thursday I will probably give the shop a call. The shop called on Thursday and said Giant is not sure if it is a crack but Giant suggested to put through a warranty claim for the frame. Sounds like it will most likely be replaced. I'll post more updates as I hear. Thanks for the update @Geo.Lewis13. I also have a 2018. I'm going to try and get mine in next week so I have documentation of it and maybe they will replace. I wasn't going to bring mine in but I'm glad I did. I would possibly take this with a grain of salt as it's all word of mouth but I heard of a guy that rides by me who had a 2015 Anthem aluminum frame that cracked and Giant replaced it free of charge. I don't know what they replaced it with but I heard he was very happy with the way they handled it. The problem is in new trunion mount. Til' 2017 it was standard mount, so if swap to new frame - shock will not fit. That's what I don't understand as well. Maybe they replaced his shock too? I have no clue. Last edited by Geo.Lewis13; 02-22-2019 at 06:18 PM. I am just wondering if this is a problem with the trance frame design. I have seen a couple reports of cracks in the same place. While my frame has been replaced, will this possibly be an ongoing problem. I understand the frames have a lifetime warranty. I would expect them to replace defects under warranty. I would gladly buy a new rear shock if I had a 3-4 year old frame replaced under warranty. Generally, Giant is very good at taking care of customers under warrantied items IMO. They seem to be pretty good. I actually haven't heard of a lot of crack issues with Giant frames which is why I was so surprised by my possible crack, especially in that location on the bend of the top tube. The shock is usually considered part of the frame. I've had two frames warrantied by Specialized and they both came with a new shock. Each frame was a year newer and one model level up. Well, in my case - i got rid of stock shock and now have my own new X2. So, hypoteticaly, if I would need a frame warranty - interesting how it would go.. This thread prompted me to have a look at my frame. Guess what? Same location, about the same size. 2017 Trance Advanced 2. Dealer told me to keep an eye on it.... if it gets worse he will submit a claim. 2017 Giant Trance Advanced 2 here. Same crack, same location. Giant is replacing my frame under warranty. They are replacing it with a 2018 frame. I am happy that they stand behind their product. I had a feeling due to how quickly they okayed the replacement that this might have been a common issue. I apologize for not updating sooner. Giant did replace my frame (with a 2019 so there's some orange and red clashing going on hahaha). Totally satisfied with the way they handled it! Glad to see you got yours replaced too. I too wonder if this is a common issue. Mine did not come with a new rear shock but I kind of requested it that way. The 2019 comes with a DPX2 which I've had nothing but problems with on bikes I've demoed. I'm much happier keeping my Deluxe. It's really case by case dependent. Giant (or insert any manufacturer) doesn't make the shock... and it's also not broken. Therefore it wouldn't routinely be replaced. However that *may* change if it's not compatible with the warranty frame that is supplied. It's the same as if your shock blew up and the frame was fine. Fox/RS wouldn't replace/repair the frame, only the shock that had a defect. Who was in that situation? That's going to be something that's worked out directly between yourself, your LBS and Giant. based on my experience, I would not expect a new rear shock. While I don't doubt some manufacturers replace the shock, I thing it is a separate component from the frame. Just discovered this forum. I am the proud owner of a giant trance advance 2. I am about to receive my 3rd replacement frame where cracks have developed in the same place. These cracks appear to be in the same place as the photo on here. My dealer has been less than helpful just stating it’s cracked due to being clamped in a bike stand. Frame 2 that is now cracked has not been in a stand and has been ridden 5 times. I have contacted Giant directly and they told me this has never happened before my 2 frames. Evidently not the case looking at this forum. Just wondering how things resolved for the previous people on this thread and reasons given for their frame cracking.